Ron really knows his way around a flipboard, as anyone who’s spent time with him in the classroom can attest. With marker as his medium, students have been enjoying his live line drawings for well over 30 years. Some of his most famous works—which he continues to practice month after month and year after year—are the infamous 5-Line Model and the popular Goal-Line/Soul-Line sketch. 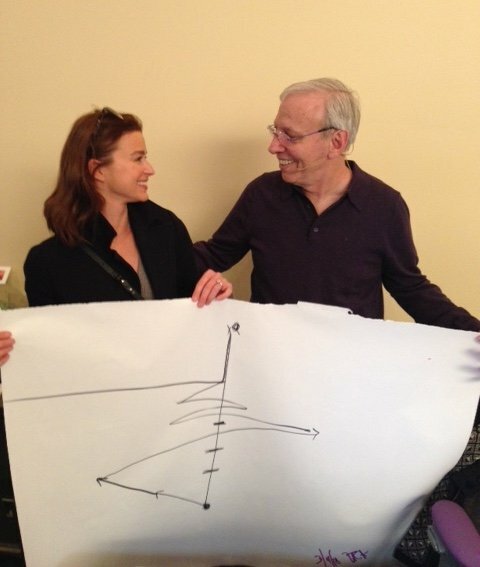 In the March Soul-Centered Living class, the students appreciated Ron’s drawing talent more than ever. He had been speaking about the Soul Line of life, and how it seldom is a direct route. We go off course, we get feedback, we go off course again, find our way back to center, we go off in another direction, and on it goes. Regardless, even when it doesn’t feel like it, we are moving up the Soul Line. Naturally, this was accompanied by a live illustration of the concept. At the end of this talk, he turned to Mary and Licia and asked if there was anything they wanted to add. Licia asked Ron if he could tilt the easel so the other side of the room could see what he drew. Class resumed, and at the break, an assistant mentioned to a friend in private conversation that he’d really like to have that graphic. A student approached that same assistant (Jesse) and said she’d like to buy the drawing Ron made and signed. Another student approached Licia and said he would like to please anonymously purchase it. The students were genuinely relating to this as a piece of art drawn in the sacred USM energy field and signed by Ron. After all, it was Spiritually charged and had some powerful energy on it! Shortly thereafter, Jesse playfully announced over a mic that he loves the piece and he also knows of a student who wants to buy it for $50. Licia responded from the stage that another student approached her and would pay $100. Another student called out that he would pay even more! And right then, the room spontaneously erupted into a bidding war with several students participating! Ron conducted the auction, which crescendoed to two students, back and forth, outbidding one another by $50 increments—straight up to $750!! I love everything about this post and through reading it, am sitting in that class energetically, and experiencing the joy and laughter, fun and awe. Thankyou for sharing. I so appreciate the spontaneity of USM students – in and out of the classroom. I think we should have more auctions!